i. Despite of the increasing number of national and international financial institutions, the increasing amount of the available statistical data and computing power, economic crises are not predicted by governments, central banks and the academic community. ii. The effectiveness of fiscal and monetary policy tools in an economy decreases over time. Just like in the human body, over time the same dose of a medicine or a drug has a diminishing effect. iii. The complexity of the economic environment (of the theoretical models, of the institutions, of the financial products and of the attempts to regulate them) has led to an increasing level of national and private debt in almost every country and in increasing the concentration of wealth of the top 1% of the population. iv. To simplify economic environment would be of great value to the society and the policy maker. It is proposed that a sovereign currency*, public debt repayment with sovereign currency** and full reserve banking***, followed by balanced budgets in the public sector would be beneficial to the Greek, the European and the world economy. The debt that Greece is expected to pay is equivalent to 175% of annual national wealth, and is an intolerable burden for the Greek people. What would happen if a greek government decided to apply, to the letter, Article 7 of a regulation adopted by the European Union in May 2013 “on the strengthening of economic and budgetary surveillance of Member States in the euro area experiencing or threatened with serious difficulties with respect to their financial stability”, concerning countries subject to a structural adjustment plan, including in particular Greece, Portugal and Cyprus. Paragraph 9 of Article 7 maintains that States subject to structural adjustment should carry out a complete order of public debt in order to explain why indebtedness increased so sharply and to identify any irregularities. Here is the text in full: “A Member State subject to a macroeconomic adjustment programme shall carry out a comprehensive audit of its public finances in order, inter alia, to assess the reasons that led to the building up of excessive levels of debt as well as to track any possible irregularity”. In order to become effective, central banks must be enabled to be true masters of the money system. They need to gain full control of the money by way of monetary quantity policy. No quantity policy is possible, however, as long as the banking industry dominates the monetary system and determines the entire stock of money, while money and capital markets inherently fail to reach some ‘equilibrium’ and self-limitation. In conclusion, banks must stop acting as monetary quasi-authorities and become purely financial institutions, meaning that the banking industry must be stripped of its monetary power to create and delete money-on-account by creating or deleting primary credit. Banks ought to be free lending and investment enterprises, but just money intermediaries in this without the illegitimate privilege of conducting business on the basis of self-created money. In the nineteenth century, and for much the same reasons, banks were stripped of their power to issue private banknotes. The monopoly of banknotes was given over to the central banks, many of which were set up in the process. Now the time is ripe for the same to be applied to money-on-account. 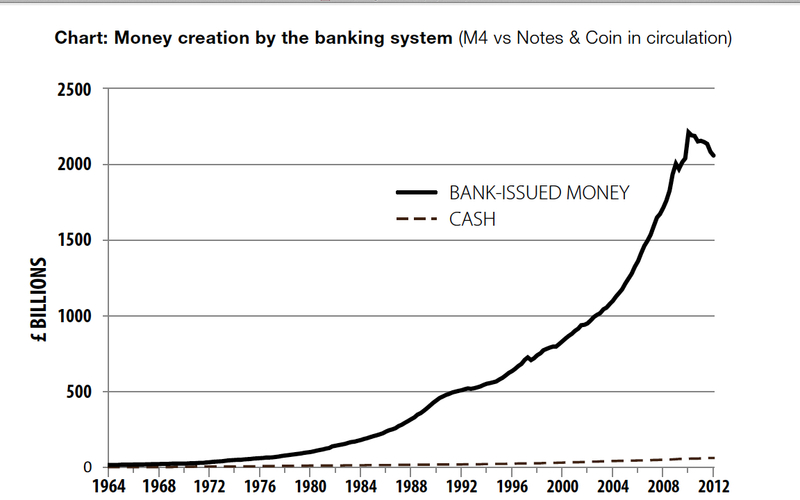 Bank money should be phased out and central-bank money in public circulation in the form of money-on-account and e-cash phased in, resulting in a sovereign money system with full control of the stock of money. In this way, a state’s, or a community of states’, monetary prerogatives of the currency (unit of account), the money (means of payments) and the seigniorage (gain from creating money) would be fully completed. Independent public central banks – acting on a well-defined legal mandate, but not taking directives from the government – are the obvious candidates for being entrusted with the functions related to the monetary prerogatives. What is Full Reserve Banking? It is easy to see that the higher the reserve ratio, the smaller the risk of a bank run. With a ratio of 100% this means that even if every single customer demanded to take out their money, the bank will have it all available. This is clearly a very safe form of banking, but as described so far, the bank would simply be acting like a safe deposit box. It would not be able to make any loans. It appears that banks can not act as financial intermediaries between savers and borrowers. Indeed there are some economists that have pronounced that full reserve banking is useless for precisely this reason… but they are mistaken and here’s why:In the context of a full reserve banking system, we need to be slightly more precise about the meaning of the reserve ratio. (1) Much better control of a major source of business cycle fluctuations, sudden increases and contractions of bank credit and of the supply of bank-created money. (2) Complete elimination of bank runs. (3) Dramatic reduction of the (net) public debt. (4) Dramatic reduction of private debt, as money creation no longer requires simultaneous debt creation. We study these claims by embedding a comprehensive and carefully calibrated model of the banking system in a DSGE model of the U.S. economy. We find support for all four of Fisher’s claims. Furthermore, output gains approach 10%, and steady state inflation can drop to zero without posing problems for the conduct of monetary policy. Right now most of the money in our economy is created by banks. Banks create up to 97% of money, in the form of the numbers in your bank account, when they make loans. This means that they effectively decide a) how much money there is in the economy, and b) where that money goes. We believe the power to create money must be removed from the banks that caused the financial crisis and returned to a democratic, transparent and accountable body. New money must only be created and used to benefit the public and society as a whole, rather than just financial sector. We have detailed and workable proposals that would allow this to happen. Even the Financial Times has written about the need to prevent banks from being able to create money. More than 97% of the money used by people and businesses in the UK is created by commer- cial, or ‘high-street’, banks. Less than 3% is created by the state or central banks (such as the Bank of England). A similar situation exists in most countries around the world. “Princes of the Yen” reveals how Japanese society was transformed to suit the agenda and desire of powerful interest groups, and how citizens were kept entirely in the dark about this. Based on a book by Professor Richard Werner, a visiting researcher at the Bank of Japan during the 90s crash, during which the stock market dropped by 80% and house prices by up to 84%. The film uncovers the real cause of this extraordinary period in recent Japanese history. Making extensive use of archival footage and TV appearances of Richard Werner from the time, the viewer is guided to a new understanding of what makes the world tick. And discovers that what happened in Japan almost 25 years ago is again repeating itself in Europe. Public borrowing should take place only based on the assumption that politicians act wisely and solely for the benefit of the people. But in the case of Greece, as in many other countries, government borrowing has only created a huge increase in bureaucracy, inefficiency and corruption. Government borrowing is identical with future taxation and is very hard to justify that a government, which is elected for a four years term, have the right to impose taxation that goes beyond that period. The Monetary Reform Act that is presented at: http://www.themoneymasters.com/monetary-reform-act/, with some ramifications, is a good road map for resolving the greek debt crisis and a first step towards full-reserve banking in eurozone. In order to make this idea easier to be approved in the eurozone, we propose that Greece should pay back the money that will be used to repay the greek debt, only in the case and in advance of any future greek government borrowing.